Microcredit aims at the economic and social integration of targeted populations through the creation of activities of goods and services production. 1 000 000 Da for the purchase of small equipment, raw materials and to pay the expenses to launch the activity. - Three (3) years for repayment of the bank loan. An interest free loan, for the purchase of raw materials that cost does not exceed 100 000 DA, this loan can reach up to 250 000 DA in southern regions. - Refundable within 24 to 36 months. 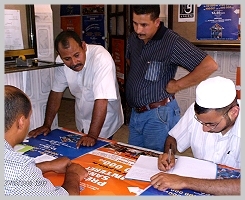 ANGEM provides free of charge care and personalized accompaniment of populations, given their specificities, while assisting micro entrepreneurs during all the important steps of their small business creation: identification of the idea, helping move the projects forward and support the start of the small businesses. Regular close follow-up, aiming at the sustainability and social and economic profitability of the created t small businesses. Much of target populations have no qualifications and have no access to bank loans eventhough they are skilled. The organization of Exhibitions -sales of products from small businesses, especially those set up by women working at home.